It is a commitment to quality and precise attention to detail that makes Haugland Brothers hardwood floor cleaning service the premier floor cleaners in Hinsdale. Haugland Brothers Carpet & Floor Care is an on site, full service floor cleaning company that can bring your hardwood floors back to life. Hinsdale homes and offices shine when Haugland Brothers works their magic on hardwood floors. Call us today to schedule your hardwood floor cleaning and see what a difference we can make on your worn hardwood floors. Our expert hardwood floor cleaning services are the best in the business, especially when you are looking to bring that brand new look back to your office or home. Haugland Brothers is proud to serve businesses and homes in the Chicago area. Our company takes great pride in making your spaces shine and has been built on a solid platform of integrity and outstanding results. 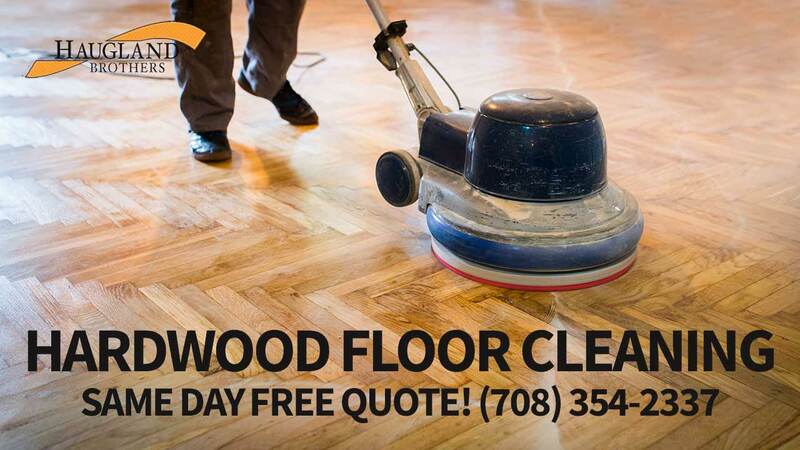 Haugland Brothers is more than a hardwood floor cleaning company. We provide a full range of services that clean, restore, and protect your beautiful investment. After a detailed consultation on the state of your hardwood floors, you decide which of our services will fulfill your needs. Whether your needs are big or small, our goal is complete satisfaction. Shiny Wood Floors From Corner to Corner! We are fully equipped with the latest innovations in hardwood floor care. Using top of the line cleaning products and finishes, our expert technicians breathe new life into your worn floors. Each step in the process is handled with professionalism and efficiency to ensure that you are 100% satisfied with the restored look of your hardwood floors. We Wax and Wane Imperfections Away! And anything else day to day life can throw at your hardwood floor. Why Should You Have Your Hardwood Floors Cleaned Professionally? Hardwood flooring in a home or office is a beautiful investment that adds a natural class and appeal that cannot be matched by other flooring products. Haugland Brothers appreciates the investment that you have made, and strives to clean and protect it so that you are able to enjoy its charm for years. Unlike your regular sweeping and spot cleaning, a professional hardwood floor cleaning gets into the grain and removes dirt and particles that are damaging the wood. Haugland Brothers hardwood floor cleaning service is also able to restore any damage done to the wood, maintaining it’s original pristine look. Children playing race cars, a pet’s sharp nails, and even sand particles from the street slowly break down the protective surface of a hardwood floor, taking the luster with it. With a professional cleaning, the wood is given new life and the luster you love is restored. How Often Should You Have Your Hardwood Floors Cleaned? The length of time that lapses in between your professional hardwood floor cleanings depends on the type of floor you have and the amount of traffic that traipses across it. The best way to tell is by comparing a corner of the floor that sees no traffic to the rest. If there is a marked difference in the sheen, then it’s time to call us! Also take a look at the cracks and grooves for dirt accumulation. Not only is that dirt ruining the look of your floor, it is destroying the integrity of the wood. Only a professional hardwood cleaning team of experts can remove that built up dirt and make your floors sparkle again. What Can You Do to Protect Your Hardwood Floor In Between Professional Cleanings? To keep the beautiful look of your hardwood floors in between cleanings you should be sweeping or vacuuming daily. This will remove the loose sand and particles that destroy your floors sheen. Use door mats and area rugs in high traffic areas to avoid dirt making it to inside the surface of the wood. Spot clean spills as they occur, and only use a damp mop when absolutely necessary. When our comes out for a visit, we will give you sound, professional advice on the best ways available to preserve your investment. How Important is Wood Floor Protection? Coating your wood floor with protective varnishes or wax is the best way you can protect your investment. Considering how important your wood floor is to the look and value of your home or business, applying a protective seal is a job best left to our professionals. Every second that passes is another grain of sand working on destroying your floors. Take action now by calling our staff at (708) 354-2337 and let us get the shine back in your floors!